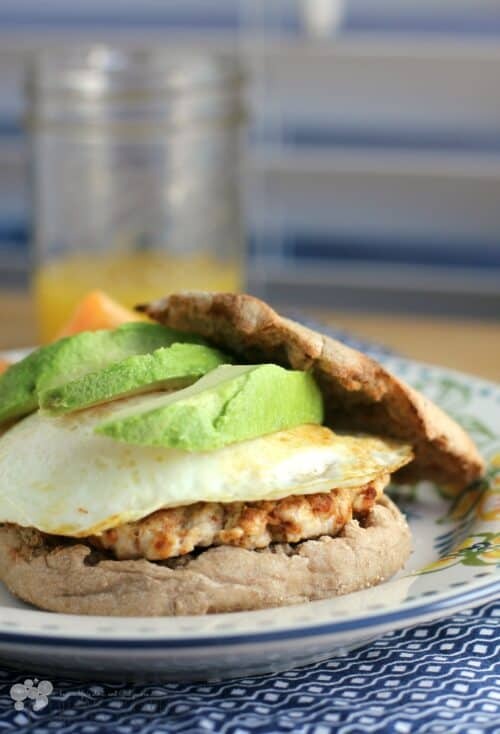 Healthy protein and fats highlight this satisfying Healthy Breakfast Sandwich with Homemade Turkey Chorizo with flavor-packed, homemade chorizo sausage! I am a creature of habit, especially when it comes to what I eat during the week. I keep things predictable and repetitive. 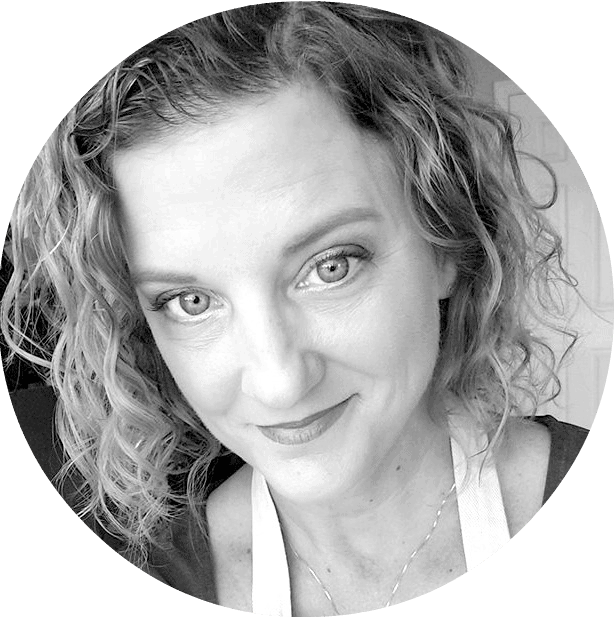 And I’ve shared what a typical food day for me looks like, because just keeping it real folks …and obviously I don’t eat Queso and Monkey Bread all the time (though boy, do I wish I could). Lately, I’ve been having a Super Good Morning Green Smoothie first thing in the morning and then following up with an egg and avocado on English muffin mid-morning. This has been making me veerrrrry happy, but I’m still getting hungry again too soon for lunchtime. This is my solution – adding a bit more lean protein to the ‘mcmuffin’, packed with a ton of flavor, does the trick perfectly. So let’s talk about this sausage… This was my first endeavor at such a thing. I love Mexican chorizo, but it’s clearly a no-no if you’re trying to eat healthy. That doesn’t mean we can’t take lean turkey and add those chorizo flavors to elevate it to something awesome, right? This way we know what we are eating. We are in control. You can even buy free-range, organic happy happy ground turkey if you like and feel even better about it. And it just tastes sooo much better than any fast food something or pre-made anything from the store freezer. With 280 calories per serving, 19g protein, 11g healthy fat, 25g whole wheat carb energy, and even a nice hit of 12% RDA of calcium as a bonus. You just can’t beat starting your day like this. And you deserve it. Put the turkey and spices in a mixing bowl. Using your fingers, combine the turkey and seasonings. Portion the turkey chorizo mixture into 16 portions. Form each portion into a ~3-inch diameter, 1/4-in thin patty. Heat a large, nonstick skillet on medium-high heat. Spray with cooking spray. 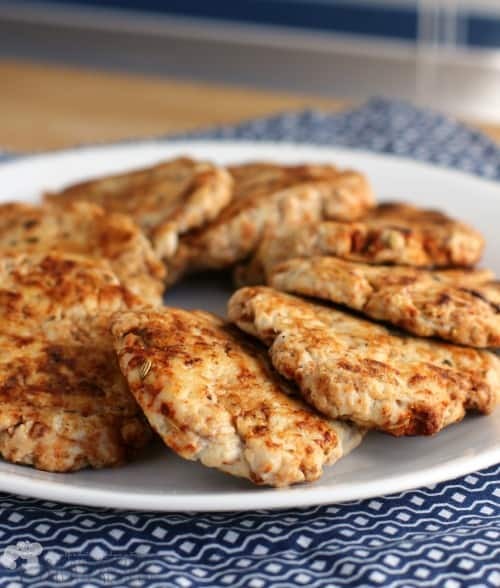 Working in batches, lay sausage patties in the pan pressing to keep them thin and flat. Cook until browned on the bottom and when you can see the edges starting to cook as well. Flip and press again with a spatula to keep the patties thin and flat. Once cooked through, transfer to a plate to cool. Repeat with the remaining sausage patties. Yield: 16 patties. Heat a small, nonstick skillet over medium-high heat. Spray with cooking spray. Add the egg and cook over easy if you want (I like a runny yolk) or all the way through if you don't. Or scramble it. Your breakfast, your choice! Toast the English muffin. 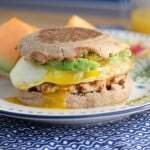 Serve with a patty of Turkey Chorizo sausage, the cooked egg, and avocado stacked in between the English muffin halves. I freeze half the patties and keep the rest in the fridge to enjoy during the week. Then the following week, I take a patty from the freezer as I want them. Also, throw on a nice slice of tomato, and it gets even better. I find if I don’t have protein I am also hungry before lunch. This is my new breakfast, I love the turkey chorizo. This will set me up for my workouts, great recipe. Now that sounds like an awesome way to start off the day! NOM. I definitely need protein if I am going to last between breakfast and lunch or lunch and dinner. I don’t think I would attempt to make my own turkey sausage–maybe I can find a healthy version pre made in the store? I have never made my own chorizo. I love this recipe. I am going to pin it to my clean eating recipe board! I have been wanting to make homemade sausage for a while, but always chicken out. This looks so easy to do and something the family can enjoy any day of the week. I am absolutely loving this breakfast sandwich with chorizo. That looks so delicious and flavorful… always love a good breakfast like this! That looks mouth watering! The ground turkey looks like a nice healthy alternative. This sounds like a wonderful recipe! 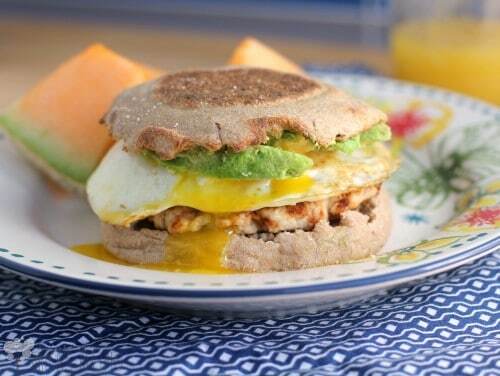 We love breakfast sandwiches! I absolutely love breakfast sandwiches! Yum! I’ve made my own turkey breakfast sausage, but I’ve never made chorizo. ON the to do list! The chorizo looks so yummy! This is much fancier than my normal breakfast, so it would be such a nice treat. I am going to be trying this, I love chorizo sausage but not all the fat that comes with it. Can’t wait to try your version of it! I agree with Mary, I love that you made chorizo healthy! Sounds like a perfect breakfast to stay on track. Oh my lanta! This looks AMAZING!!!! I would love to have this for breakfast! Oh yeah Erica! This is my kind of breakfast and I imagine the fiber content it good too! Wow. I have always said I love food with lots of flavor and that turkey chorizo is loaded with it! This looks and sounds like an awesome breakfast choice! I am definitely saving this recipe! Thanks! Love a good chorizo sausage! Oh I love the addition of the avocado! I bet it tastes fantastic!! That looks so satisfying and delicious, Erica! Love that you gave all the nutriotional info on this too! Thanks! Now THIS is how breakfast should look. I want and need this! Yum, this looks great. This is a perfect way to start the day!